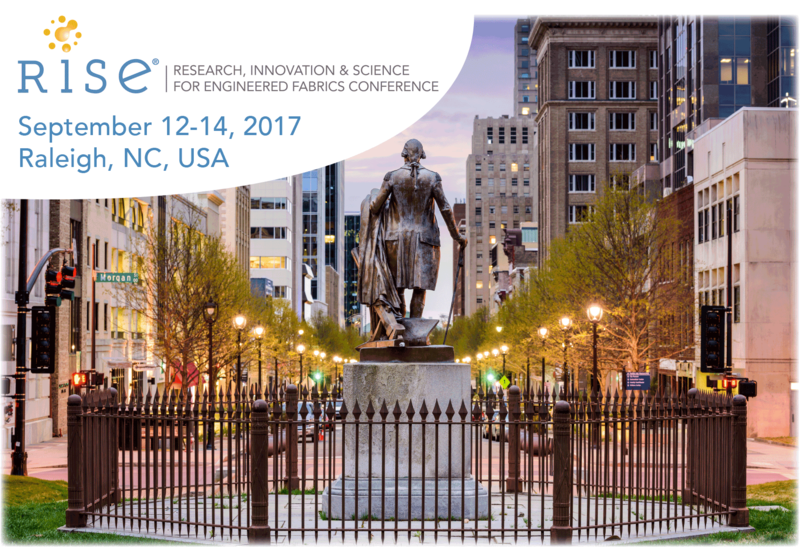 Aug. 24, 2016 – Cary, NC – The Research, Innovation & Science for Engineered Fabrics Conference, RISE® 2017, will be held Sept. 12-14, at the Sheraton Raleigh Hotel in North Carolina, INDA, the Association of the Nonwoven Fabrics Industry, has announced. Now in its seventh edition, RISE 2017 will connect new and emerging technologies with near-term commercial applications and provide immediate real-world solutions to industry needs. “The RISE 2017 Conference embraces INDA’s mission to stimulate, recognize and reward innovation. 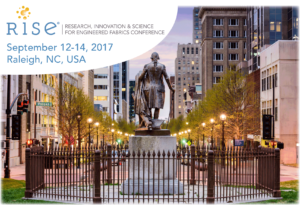 RISE brings together like-minded, forward-thinking technology professionals with presenters of new approaches to material science challenges. From fiber technologies and processing developments to new functionalizing developments and the innovation process itself, this will truly be an event not to be missed,” said Dave Rousse, INDA’s President. RISE 2017 will feature two-and-a-half impactful days of learning about game-changing research, innovation, and science. The event focuses on what’s to come in engineered materials with leading-edge speakers, networking, and the presentation of the annual RISE Innovation Award. At RISE, technology scouts, business/product development professionals, innovation teams, product managers, and research engineers will hear about new technologies and how they can be applied to their products and research innovations in consumer, industrial, and institutional markets. The latest technical developments in related industries that can potentially be applied to engineered fabrics also will be presented. at +1 919 459 3726 or email: tleatham@inda.org. INDA, the Association of the Nonwoven Fabrics Industry, serves hundreds of member companies in the nonwovens/engineered fabrics industry in global commerce. Since 1968, INDA events have helped members connect, learn, innovate, and develop their businesses. INDA educational courses, market data, test methods, consultancy, and issue advocacy help members succeed by providing them the information they need to better plan and execute their business strategies. For more information, visit inda.org or call + 1 919 459 3700.